Apple on Monday kicked off its annual Worldwide Developers Conference in San Francisco. Craig Federighi, senior VP of Software Engineering at Apple, drew the assignment of unveiling one -- well pretty much all -- of the biggest highlights of the keynote, iOS 8. 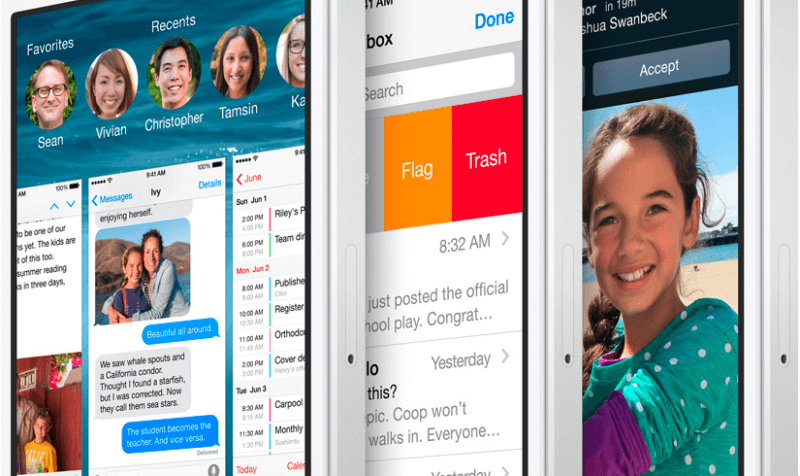 As anticipated, iOS 8 includes a wealth of updates and new features starting with interactive notifications. With the update, users will be able to pull down from a notification and reply to it right there without having to leave what they’re doing. Speaking of, Messaging also receives a number of enhancements. Group messaging now allows users to name threads, remove people from a conversation that is already under way, leave a thread at any time and even assign a “do not disturb” policy on a per-thread basis. Additionally, users can add location data, pictures and other attachments to threads. There’s now a talk button that allows users to add voice messages directly to the thread. But perhaps best yet, all of the media is self-destructing so it won’t clutter up the thread as it grows. Federighi showed off a new "QuickType" keyboard that supports predictive typing suggestions (not unlike Android) and contextual answers. For example, if someone sends you a message that asks if you’d like to see a movie or go to dinner, the predictive text will offer up choices like “dinner” or “a movie” to choose from without requiring you to type the entire answer. The service will learn your behavior and suggest common phrases as answers. All of this learning is done locally to protect privacy. Family Share is another new feature that’s likely to be a big hit. Federighi likened it to the fridge of yesteryear where people would share pictures and leave messages for others in the family. Apple’s take on that theme allows up to six family members to create a family link in iOS so they can share things like photo streams, reminder lists, calendars and even have access to Find My Friends. Users can also share purchased media although the songs, movies and whatnot must all be purchased from the same credit card. In the event there are children on the account with access to this central credit card, parents can configure the service to notify them for authorization whenever their child attempts to purchase something with the card. Apple also updated Photos in iOS 8 with smarter editing controls for light, color, auto straightening and cropping. Searching through images is improved through the use of location and now, all pictures you snap will be available on all devices through iCloud. These images will be saved in their original format in full resolution which means you’ll likely need some additional space. For that, Apple is rolling out a new pricing structure in which the first 5GB of storage will still be free but after that, pricing starts at $0.99 per month for 20GB of storage or $3.99 for 200GB of space. Apple only briefly touched on its health and home automation initiatives which are strongly tied to what developers start to do with them, but we did learn about HealthKit, a hub for all health-related app data. It’s being marketed as an improvement over current solutions that force you to visit each app to view the vitals they collect. Other updates include Continuity integration, improved enterprise features, iCloud Drive, Siri song recognition, better mail management and more. iOS 8 is available in beta today for developers and will arrive as a consumer product this fall.